Many people pass this hidden gem of a property on their way to Beavertail State Park without even knowing it is there. It is a historically significant site that takes one through decades of military history. Like nearby Beavertail, Fort Wetherill, and Fort Adams, this property has remains of bunkers as well as it highlight, the battery. There is also a short wooded trail that circles around the property. On the north side of the parking lot (opposite side of the main entrance) is a trail entrance to the North Loop. At the first intersection stay to the right. The trail winds through an area of heavy brush, a haven for birds. At the next intersection stay to the right. This trail will lead you to a large lawn. In this area is the battery that was built during the American Revolution as a defensive fort. Among the mounds cannons would fire to nearby enemy ships. There is also a trail that leads to a significantly large boulder before turning north and uphill to a series of World War era concrete bunkers. These structures are actually spotting stations built upon Prospect Hill to warn the nearby armed forts of incoming enemy vessels. There are six bunkers in total. Evidence of Native American activity has also been found on this property. Though small, this property offers quite a bit and makes a nice supplement to a walk at Beavertail State Park. This lesser known property consists of a short loop trail and connector that features a few boardwalks. The trail can be a little muddy in spots and is a little root bound, so do watch your footing. 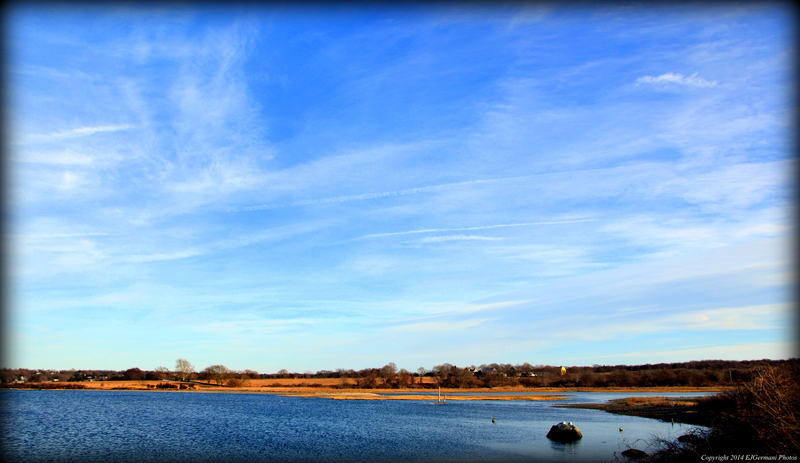 There are three observation areas that overlook Marsh Meadows, a large salt cove. The first is an area with a sitting bench, the other two are raised observation decks. Many birds here have been seen including egrets, herons, sandpipers, ospreys, and ibis. Needless to say this spot for birdwatchers and photographers. Across the salt marsh is a farm and it is not uncommon to hear the mooing of cows. The property also features stone walls and a grove of white birch. Parking is not easy at all as the trailhead is actually at a highway off-ramp. The Jamestown Police Station is a few hundred feet south of the property. I had parked there. I did go in and ask permission to do so and suggest that you do to. The little bit of the walk from there to the trail head is well worth it though. This is a great property! This Conanicut Island Land Trust property in the north central part of Jamestown is a large open field with old farm equipment and stone structures. The once active produce farm is now being used for plantings of native trees and shrubs, many with berries to attract birds. Several birdhouses are here as well and there is an effort to build nesting boxes for the eastern bluebirds who have made Godena their home. The walk here is along grass mowed paths throughout the property and there is signage explaining the history and plans of this property. Also, snowshoeing has been encouraged here the last couple of winters. Parker Farm is a Conanicut Land Trust property at the northern end of Jamestown. 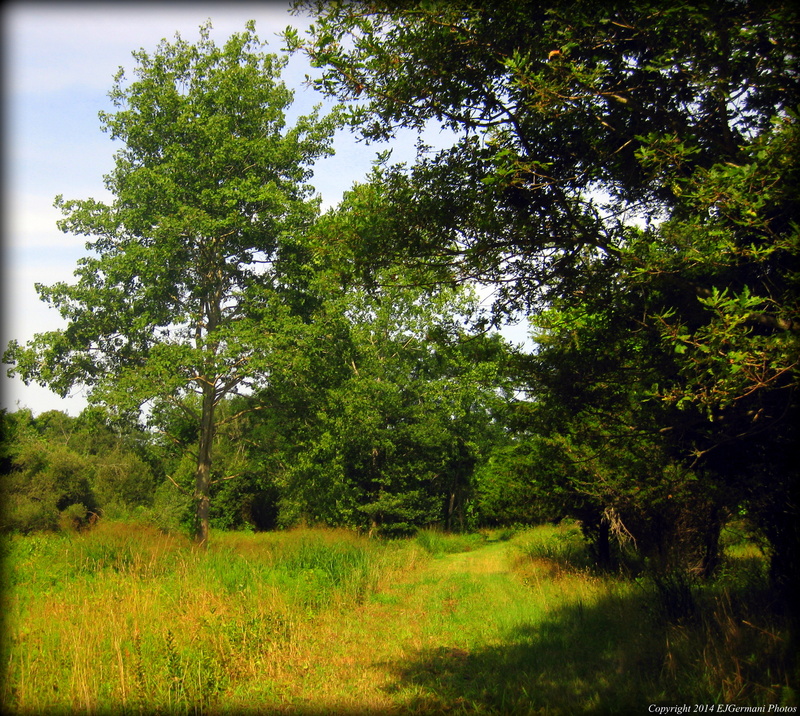 It is a quaint spot that has a mowed trail through some woods and fields. The parking area is just north of a stone drive that enters the property. The stone drive serves also as the driveway for the abutting property. I was joined by a friend for this hike and we started by making our way to the gate just after the driveway opening on the left. After passing the gate we followed the Mower Trail as it wound through an area of trees. I didn’t notice much of side trails even though they were shown on the map. When we came to the intersection we went left and completed the loop the followed the perimeter of the field. Returning to the intersection we turned left again following the trail to its dead end. From here we retraced our steps back to the car. We came across several birds and squirrels here as well as a few deer. Trail map can be found at: Parker Farm. Moderate due to rocky footing in areas, some elevation. EXERCISE CAUTION NEAR CLIFFS AND AROUND FORT. I was joined by a group of explorers today for this hike. We had stopped initially to take in the views from the cliffs here. I stop here often when in the area and today was no exception. We first embarked towards the cliffs from the second parking area. From the cliffs you get a sweeping view of where the bay meets the ocean. Across the way you can see the Castle Hill Light and in the distance you can see the Beavertail Light. After showing my young guests the beauty of this location they discovered a narrow path. And off hiking we went. Wetherill has a vast network of narrow paths that meander throughout the park. In fact one could easily make a 2 mile hike here, if not more. Being lead by the kids there was no rhyme or reason to our route. I turned on the GPS out of curiosity to record the distance and off we went. Within a few minutes we came across the old fort. After giving a quick history lesson, the kids imaginations were running away of what this must have been like back in the day. We spent quite of bit time exploring the area being sure to stay in the safest areas. Many do venture into the fort. The rooms are damp, cool, and covered in graffiti. (Some of the graffiti is unsavory for children, however it seemed my guests were distracted enough by their imaginations and excitement). After we reached the far end of the fort we made our way back to the car. 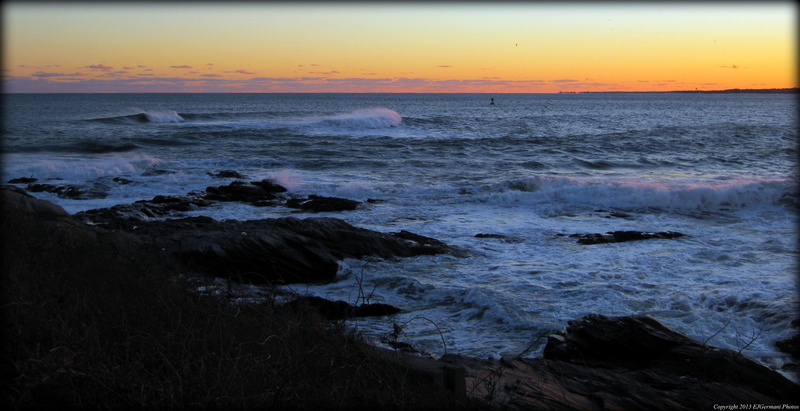 Beavertail is easily one of the most beautiful locations in Rhode Island if not all of New England. Also, there are centuries of history here at its rocky shores. Beavertail has always been a place I am drawn to, whether it’s to take in the beauty of the ocean or to come and contemplate life, I have always found it peaceful and cleansing. Starting this hike at parking lot 2, I headed north through the grass field to the beginning of the trail. The trail along this part of the hike is a wide grass walking path surrounded by tall shrubs. Just after getting on the trail it immediately splits, I stayed to right, to the left is a viewing area. Along the way there will be several areas that overlook the West Passage of Narragansett Bay. From the viewing areas you will be able to see the Point Judith Lighthouse, the remains of the Whale Rock Lighthouse, and the Narragansett shoreline. I continued in a northerly direction following the main trail, ignoring the trails to the right that lead to parking lot 1. After about 7/8 of a mile the trail bears to the right and away from the shore and uphill. The trail that follows the shore becomes very narrow and will lead off of the parks property. After bearing to the right I followed the trail until it came to an intersection with pavement. Here I turned right onto a narrow path and took the next left. (Note: In months other than summer there is a grassy area that looks like it might be a trail to the left, this is not the trail you will be looking for.) Soon this trail merges with another from the left. I continued straight until I found the next trail on the left. Here I turned left and followed the trail into a field. At the end of this trail I turned left once again and followed the trail straight to parking lot 1. Here I turned left and followed the entrance road of the parking lot, then crossed the main entrance road and followed the exit road in the opposite direction for a few hundred feet. Soon I beared left off of the asphalt road onto a grass covered access road that runs along a set of power lines. The road led me first to an abandoned World War II era Quonset hut before coming to an open grass field overlooking Rhode Island Sound. Here there are two options, the first is to continue ahead and follow the trail to the rocky shore, the second is to turn right and follow the narrow trail that will lead back toward the lighthouse. 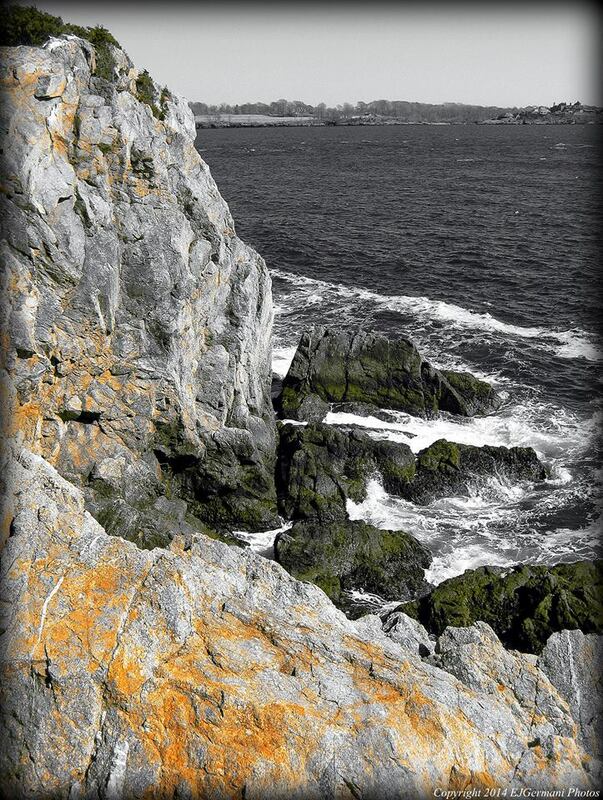 If you choose the first, exercise extreme caution while on the rocks as they can be slippery and dangerous. For this hike I first chose option one, scaling the rocks nearly a thousand feet as I made my way northeasterly toward a great natural feature. One of Beavertails lesser known gems is the Lions Head Gorge, a natural chasm that waves crash into. Be extremely careful here. From this vantage point you will be able to see the top of the Newport Bridge, the Naval War College (tan colored building), the Castle Hill Lighthouse, and Brenton Point. From here, I retraced my steps very carefully back to the grass field, looked for the small wooden bridge at the beginning of the trail, and then followed it making my way toward the lighthouse. The trail soon ends and the remainder of the walk is across grass fields near the edge of the rocky shore. After passing parking lot 4, I came to more remains of World War II, a bunker and two circular structures that once held a pair of 16 inch guns. Beavertail, along with several other sites along the shore, was once a coastal defense fort in the days of war. Most people don’t realize that one of the last battles in World War II happened 16 miles off the coast of Beavertail. A German U-boat was sunk during the Battle of Point Judith after sinking the S.S. Black Point in May of 1945. Continuing along the shore I finally came to the highlight of the property. The lighthouse that stands at the tip of Beavertail was built in 1856 and is 64 feet tall. It was the third lighthouse built on this site, the first being built in 1749 was destroyed by fire and rebuilt in 1753. During the American Revolution the British burned the lighthouse while they were retreating from Newport. It was refurnished in 1783. Finally, the lighthouse that stands today was built. 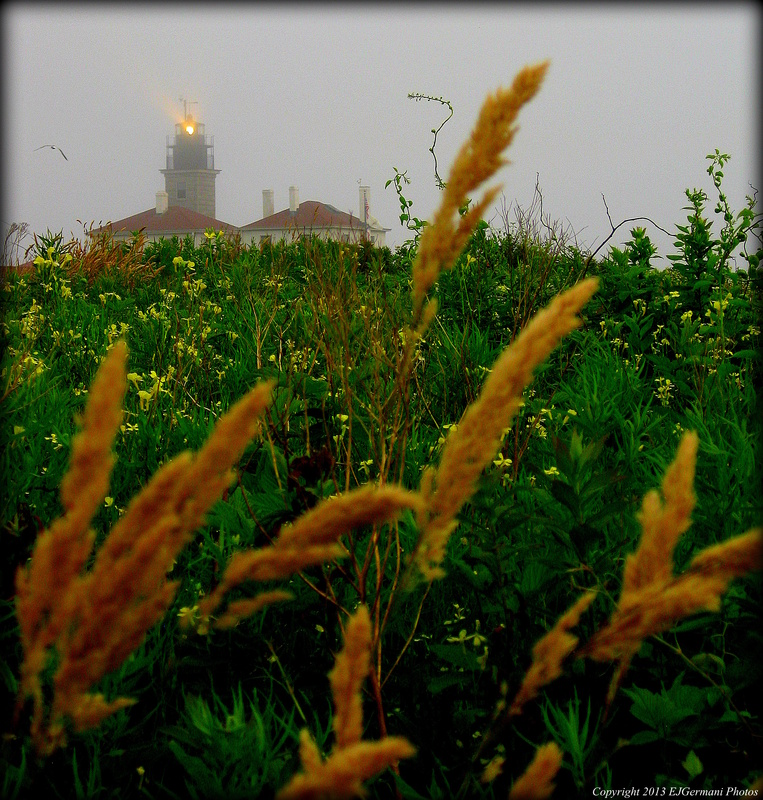 Furthermore, the original Beavertail lighthouse was the third built in the American Colonies after the Boston Harbor Light and the Great Point Light on Nantucket were built. Its foundation, with a compass on its floor, is just south of the current lighthouse. There is a very informative plaque near the foundation of an older lighthouse that explains the history of the Beavertail lights. Also at the point, enclosed in a fenced area, is a foghorn. Beware not to stand to close on a foggy day. From here I made my way back to parking lot 2 and concluded the hike. Beavertail is also home to many deer and eastern cottontails. Spotting either at any time of the day is not uncommon. Trail map can be found at: Beavertail.